Taoiseach Leo Varadkar has said that British Prime Minister Theresa May is expected to table a new proposal on the future customs relationship between the European Union and the UK within the next two weeks. Following a meeting with Mrs May in the Bulgarian capital Sofia, Mr Varadkar said the prime minister had given him some insights into what he called "new thinking" on the British side. He hinted that the British proposal would see the UK aligned with the EU customs union for some time to come. He told reporters: "I said to the prime minister that any move that helped to align all of the EU and the UK in terms of customs into the future would be beneficial. "It would help solve some of the problems related to the border but not all of them. It would certainly help us continue to trade between Britain and Ireland much as we do now." Following a 45-minute meeting on the margins of the EU-Western Balkans Summit, Mr Varadkar warned repeatedly that keeping the UK aligned on customs was not the only thing required to avoid a hard border. There were issues involving continued alignment on the rules of the single market north and south, he said. Mrs May's new thinking, he said, was presented "verbally and conceptually" and as such Dublin could not respond until it was presented as a formal written proposal in the Brexit negotiations. He said he was "not discouraged" by the meeting. Mr Varadkar said: "The prime minister gave me an insight into some new thinking the UK government as in relation to customs. Obviously, we'll see how that develops. We haven't been able to get any detail on that yet, but certainly any move on customs that brings the UK closer to the EU is to be welcomed. "But I very much emphasised that resolving the issue of avoiding a hard border requires more than just customs. "But if the UK is going to make a move in that space it's certainly something we're willing to examine." He said he made it clear to the prime minister that Ireland would insist on its red line of a legally operable backstop in the Withdrawal Agreement, whatever progress was made on customs. Asked if Mrs May could deliver on a new customs relationship given the depths of opposition by hardliners in her cabinet, the Taoiseach said he believed she could, although it involved the "internal politics of the UK". He said: "The position of the UK government is what she tells me it is and the position of the UK government is what they present to us in writing." 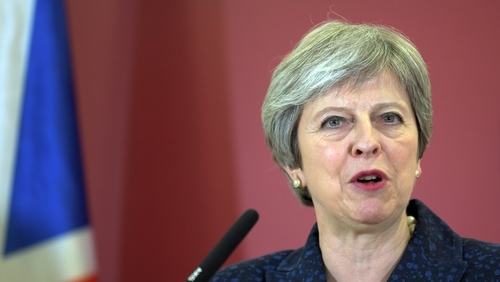 Mrs May said the UK would leave the EU customs union after Brexit but a source told Reuters that London was considering a backstop plan that would apply the bloc's external tariffs beyond December 2020. Asked about reports that London would ask to stay in the European Union's customs area beyond the end of a post-Brexit transition period in 2020, Mrs May denied she was "climbing down" on plans to leave. "No. The United Kingdom will be leaving the customs union as we're leaving the European Union. Of course, we will be negotiating future customs arrangements with the European Union and I've set three objectives," she said. She said the objectives were that Britain should have its own trade policy with the rest of the world, should have frictionless trade with the EU and that there be no hard border with EU member Ireland. In talks with European Commission President Jean-Claude Juncker and European Council President Donald Tusk, she reiterated her view that a backstop agreement put forward by Brussels to prevent a hard border was "unacceptable". "The prime minister said the UK would shortly put forward its own backstop proposal in relation to customs," her spokeswoman said. EU leaders gathered in Sofia for a summit with the leaders of the Western Balkan countries. The meeting, held under the Bulgarian presidency, is designed to re-establish a so-called European perspective for the countries of the former Yugoslavia and other Western Balkan states. The idea of former Balkan enemies establishing democracy on a pathway to eventual EU membership has become strained due to what is often described as enlargement fatigue among European electorates. While EU leaders are not about to reboot the process, they are keen to offer incentives for Western Balkan states to develop and to strengthen the rule of law. They are at the forefront of key strategic problems, such as immigration, radicalisation, interference by Russia, as well as human trafficking and drugs smuggling.